Just when you think the New York Knicks are heading down the right path, they turn around and drive the wrong direction on a one way street. On the heels of good news comes devastating news. With a smart pickup comes a head scratching decision. There is simply not enough time in New York Knicks land to enjoy one of their managerial moves. For those of you who aren’t quite sure what I’m talking about, the Knicks have agreed to a 2-year deal with Metta World Peace (a deal worth $3.2 million and has a player option on the second year). At the same time the news of this signing broke, the horrifying news of J.R. Smith’s knee surgery hit “news stands”. All you twitter children out there are probably saying uhhh, what’s a news stand? Now I know it’s hard to figure out which is the good news and which is the bad, but rest assured I’ll clear it up for you. Metta World Peace is a slight risk at all times, but if he plays the gritty physical defense we know he can then the reward will outweigh the risk. Personally, I like the signing because he brings to the floor exactly what the Knicks lack; psychotic tendencies. Even at the ripe ‘old’ age of 33, the artist formerly known as Ron Artest can still contribute at the defensive end. Now while I like the signing, World Peace is not the savior for the Knicks franchise (like some unrealistic and over zealous Knicks fans think). 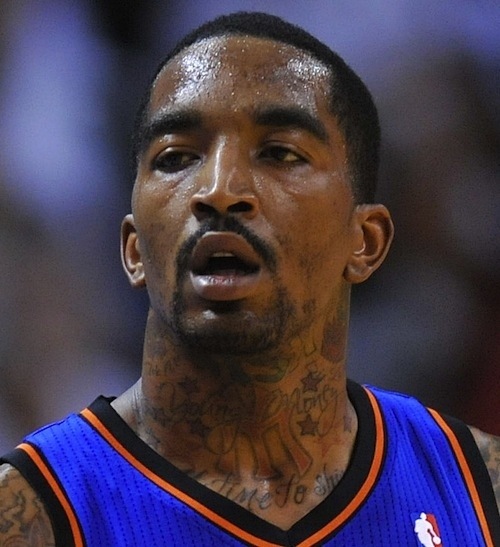 J.R. Smith is also not the Knicks savior, but he is an integral part of the Knicks game plan. And that is why it was horrifying to learn that just weeks after the ink dried on his 4-year, $24.7 million extension, Smith is currently laid up after patellar tendon surgery and arthroscopy on a torn meniscus. Such a surgery will require 3-4 months recovery time, and trust me Smith will never be the same again. Of all the absurdly stupid decisions the Knicks have made in the past, this is by far the most ridiculous. The Knicks claim to have known that Smith would need surgery for his chronic and gradually worsening injuries. ARE YOU SERIOUS RIGHT NOW?!?!?! Did the Knicks not learn anything from the Amar’e Stoudemire disaster? To answer my own question, obviously not! This is worse than the Amar’e Stoudemire deal by a landslide because even if Smith returns healthy and produces at a high level, you should learn from your mistakes. That is the first thing parents teach their children, but obviously Glen Grunwald’s parents nanny didn’t remember to teach him that one. Here’s a bit of advice for every president or general manager of a club thinking ofsigning a player with a chronic injury to a long term deal; DON’T DO IT! The Knicks are as poorly a run franchise that you’ll ever find. The end.